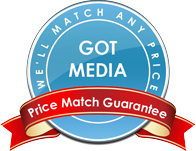 GotMedia sells a full line of Microboards Ink Cartridges at great prices in Orange County, CA. With Microboards CD DVD ink cartridges in stock for top Microboards CD DVD disc printers such as the GX-1, GX-2, PF-2, PF-3, MX-1, MX-2 and the PF-Pro, Gotmedia is your one stop shop for all your Microboards CD DVD ink cartridge needs. Be sure to also look through our inventory of inkjet printable DVD-R and inkjet printable CD-R media. If you would like assistance in choosing the correct ink cartridge for your Microboards disc printer, please call one of our knowledgeable representatives at 1-866-409-1090. The replacement black ink cartridges are specially made by HP. This is a black monocolor ink cartridge with fast dry ink. The "A" in the part number distinguishes a fast dry ink cartridge. The V101B replacement black ink cartridge is made by Microboards. It is compatible with Microboards PF-3 or CX-1. The V102C replacement color ink cartridge is made by Microboards. It is compatible with Microboards PF-3 or CX-1.